Sending your Mac signal to an Apple TV device will allow you to play movies or show images on a TV. 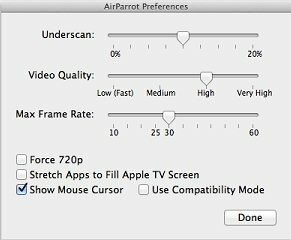 Downloading AirParrot will help you to make use of this function comfortably. 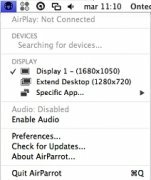 Downloading AirParrot for Mac will allow you to enjoy the contents of your computer on your TV making use of a Wi-Fi connection. 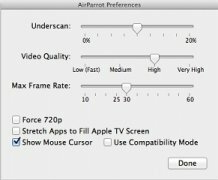 To do so you'll only need an Apple TV device and AirParrot will do the rest, providing you with very high quality video also. Customizable video quality that allows you to adapt it to the quality and strength of the wireless signal. Desktop extended to your TV screen. Play the applications on your TV. Share your desktop with whoever you want. AirParrot doesn't require a complicated start-up. You only need to install it and search for the compatible devices to choose from to be able to share the signal with thanks to Apple's AirPlay technology. Don't hesitate about downloading AirParrot and take the signal of your Mac to your TV. Requires OS X 10.6.8 or above. This a trial version that can only be used for 20 minutes.